Thursday, we grocery shopped, so now we have much more options for lunch! 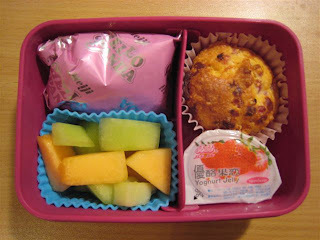 Faith took a ham & cheese muffin, a yogurt jelly, fresh melons and panda cookies. She was quite happy to have the fresh fruit option again. ;o) Apparently, canned mandarin oranges don't cut it for her. The stuffed muffins--Jiffy corn muffin mix (made per the directions with milk & an egg), 2/3 cup or so, maybe a bit more, of diced cooked ham, another 2/3-1 cup of shredded cheese (I used the shredded Velveeta since I had it opened already). Mix up the muffin mix, added in the ham and cheese and bake per the package directions. Thanks! Fast and yummy! And my boy will eat these up!